After self-examination ("in right") and fellowship ("out right"), the third area of growth while being a follower is worship ("up right"). For worship to be effective, you must become like Him, be in awe of Him, and express your feelings for Him. Like a child pressing her little hand to her lips and then blowing a kiss in the direction of her father, the Greek language defines expressions of worship as kissing toward Heaven. In John 4, Jesus discussed the true meaning of worship with a Samaritan woman. As He concluded His discussion with her, He gave these important conditions for acceptable worship, "God is Spirit, and those who worship Him must worship in spirit and truth." (John 4:24, NKJV) In other words, because God is spirit we must approach Him in His nature. "In spirit" - A spirit is not confined to things or places. Jesus told the woman that competition over which mountain to worship upon was quickly coming to an end. (John 4:19-21) Worship that centers on objects or locations does not center on God's nature. As a Christian, you have received the nature of God. His Spirit dwells within you (I John 4:13-15) and draws you past the limitations of places and things. This Spirit of God helps you pray in a language that is too holy to be uttered. (Romans 8:26) He helps you understand the deep ways of Divine holiness. (I Corinthians 2:10-12, Hebrews 6:4) He gives you strength to rise above a world of materialism and wickedness. The Spirit is your lifeline to Heaven. Developing the nature of God is the greatest form of Divine flattery and the true essence of worship. As you sing, pray, meditate, commune, and engage in other expressions of worship, focus on finding God within those activities. 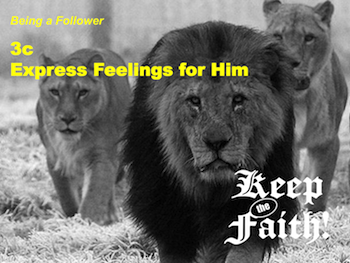 Allow Him to caress your heart while He draws your thoughts and emotions to Him. Embrace the nature of God. Honesty - For worship to be pleasing, it must come from an honest heart. In I Corinthians 11:29, we are commanded to examine ourselves before taking communion because those who approach God must be pure. Worship must flow from a heart that is responsive to God's conviction and in full surrender to His adjustments. To worship in truth, you must worship in honesty. Are you being honest about the condition of your soul? Sincerity - Sincerity describes a resolve that is born of an emotional impact. Worship that is filled with emotionless rituals is not worship at all. To worship in truth you must worship with emotion. What emotions does your worship include? Accuracy - The word truth also implies accuracy. The more a person loves someone, the more accurate they become in knowing and fulfilling the desires of that person. God has preferences and desires just like you. The more you love Him, the more you will want to know how to please Him. Study the New Testament style and content of worship. Imitate the examples God has left for you in His Word. To worship in truth is to worship in accuracy. How accurate is your worship? How many times each day do you send kisses toward Heaven? Like a father who longs for hugs and kisses from his child, God longs for your expressions of devotion to Him. You were not just created for God to love; you were also created to love Him. Give God what He deserves. Send Him a kiss today. Make a list of your favorite expressions of awe for God. Find time every day to send these kisses toward Heaven. Before leaving to go to the church building, allow yourself and your family 30 minutes to prepare your hearts for worship. Spend time each week considering how you can improve your expressions of worship. Take inventory of your congregation's worship services. Make a list of suggestions or things that could be done to promote better expressions of worship. Humbly submit these suggestions to the church leadership for consideration. In the verse above, we are told to worship God "acceptably." Define this term and then make a list of the things that people often do to express their worship to God. Beside each of these expressions, list a passage of Scripture that shows a command or example of that form of worship. The more you love God, the more you will want to give Him what pleases Him. The Bible is God's love letter to the world. In it, He expresses His love for you and explains the ways that you can best express your love for Him. In the verse above, we are also told to worship God with "reverence." Make a list of expressions of worship that are not reverent. In the verse above, we are also told to worship God with "awe." Review the previous chapter and then define this important word. Read and discuss Psalm 100:2-5. What does it tell you about expressions of worship and the condition of a worshipful heart? Also, don't forget the first eight lessons in the "Being a Follower" section! Back to Top of "Keep the Faith! Being a Follower 3c"